This product is a bundle of two cages. Ordering one of this item will get two cages delivered to you. 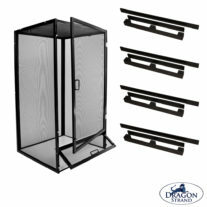 The Dragon Strand Medium Wide Breeder Cage is designed for mid-sized arboreal reptiles and amphibians. This size is suitable for Uroplatus leaf tailed geckos, Rhacodactylus, Abronia, Phyllomedusa and other like sized herps. Small to mid-size chameleons that would do well in this space include South African Bradypodion, Carpet Chameleons (Furcifer lateralis), Fischer’s Chameleons (Kinyongia multituberculata), Trioceros sternfeldi, or female Panther Chameleons (Furcifer pardalis). 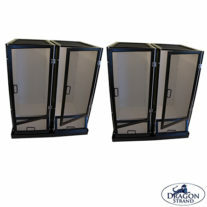 The Breeder Series cages are designed for the breeder or keeper who keeps multiple herps in the same room. Solid cage walls provide visual isolation, more effective lighting, and containment for your mist and watering. Keep the mist in the cage and off your room floor and walls! Specially designed branch holders make it simple to branch your cage with wood branches or artificial vines. Removable cage bottoms are accessible through a trap door making daily cleaning easy with minimal disturbance to the inhabitants. These cages fit standard 18” deep wire shelving making the most efficient use of your space. A Drainage Tray to collect excess water is available here. Two Substrate Trays are available The 3” high tray is available here and the 6” high tray is available here. 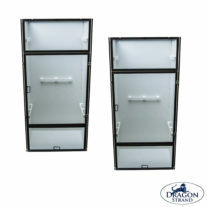 Please note that the Medium Wide Breeder Cage uses the Large Breeder Drainage Tray and the Large Breeder Substrate Tray. 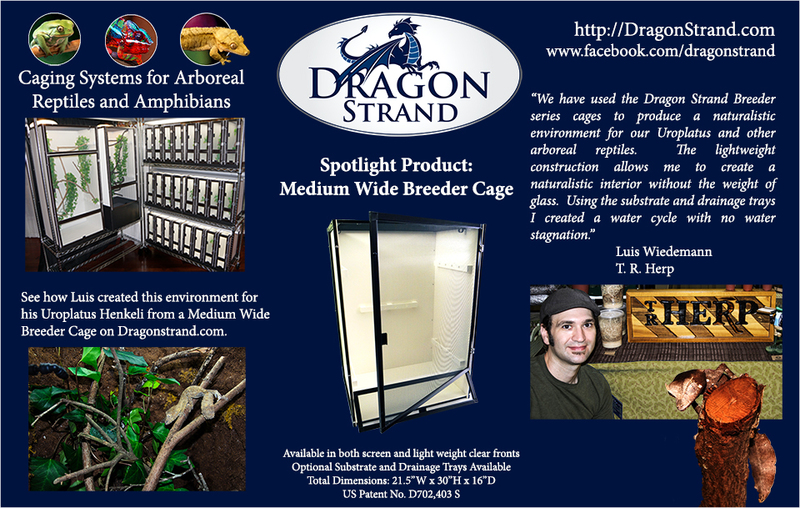 The Dragon Strand Medium Wide Breeder Cage is designed for mid-sized arboreal reptiles and amphibians. This size is suitable for Uroplatus leaf tailed geckos, Rhacodactylus, Abronia, Phyllomedusa and other like sized herps. Check here for a complete article on setting up the Medium Wide cage for a naturalistic environment (in this case, for Uroplatus sameiti leaf tailed geckos). Both a Drainage Tray and Substrate Tray are additionally available. The Drainage Tray catches water from any sort of misting system or hydration protocol that falls to the bottom of the cage. The Substrate Tray may be used by herp owners that require a substrate for their animals. The Substrate Tray fits inside the cage and provides 2.5” or 5.5” (depending on which tray) depth for moss, soil, and drainage. The Medium Wide Breeder Cage sitting on top a Drainage Tray will fill out the following dimensions: 22.5”W x 17.5”D x 31.5”H. 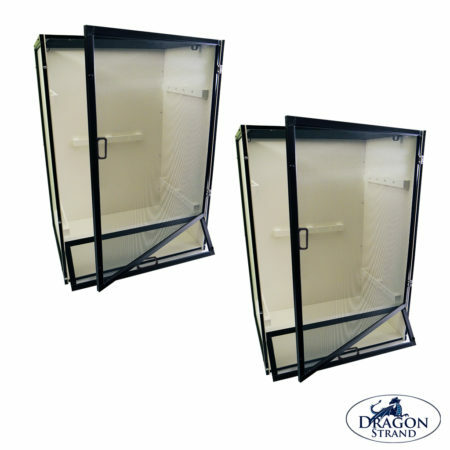 Please note that the Medium Wide Breeder Cage uses the Large Breeder Drainage Tray and the Large Breeder Substrate Tray (both 3″ and 6″ versions).